The United States Mint has developed three new products types which incorporate the new America the Beautiful Quarters. The first two have already gone on sale, while the third will be available next week on November 23, 2010. The America the Beautiful Quarters Program is authorized under Public Law 110-456, which provides for the redesign and issuance of quarters emblematic of National Parks or sites in each state, territory, and the District of Columbia. The quarters are issued for general circulation, as well as included in numismatic products created by the United States Mint. 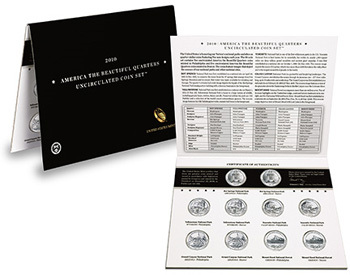 Prior to the announcement of the new products, the quarters had been available in annual Proof Sets, Mint Sets, 2010 America the Beautiful Quarters Proof Sets, and numismatic bags and rolls for each individual release. 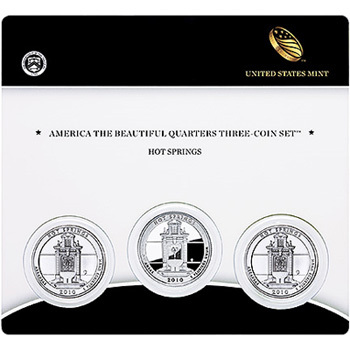 On November 17, the US Mint released the America the Beautiful Quarters Three Coin Set for the Hot Springs National Park Quarter. This product includes two uncirculated quarters from the Philadelphia and Denver Mints, with one proof quarter from the San Francisco Mint. The coins are mounted on a plastic card with coin design and site information as well as a certificate of authenticity. The product is price at $13.95. 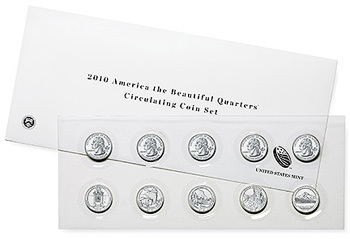 Additional sets will be issued for the remaining 2010 America the Beautiful Quarters in the following year. Today, November 19 at 12:00 PM ET, the 2010 America the Beautiful Quarters Circulating Coin Set was released. This set features all ten of the circulation coins issued for the series this year, including Hot Springs, Yellowstone, Yosemite, Grand Canyon, and Mount Hood. The packaging allows the coins to be taken out of the set for placement in coin albums. Each set is priced at $9.95. Next week on November 23, the 2010 America the Beautiful Quarters Uncirculated Coin Set will be released. This set includes uncirculated quality versions of this year’s releases from the Philadelphia and Denver Mint. These coins have a special satin finish, which is used for certain US Mint annual sets and product offerings. The sets are priced at $21.95 each.